The WIYN Observatory supports the current and future research and education needs of its scientists by operating and maintaining the WIYN facilities at a superb level of performance, and by developing opportunities to enable frontier astrophysical research. 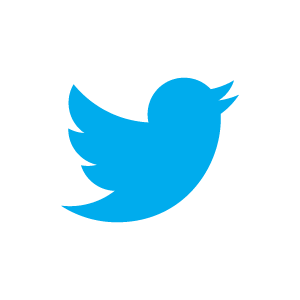 For current status of instrumentation and potential operational impact please see the WIYN Operational Status page. Active asteroids blur the distinction between asteroids and comets, with asteroid-like orbits but comet-like appearances (coma, tail etc.) caused by dust and gas ejection. An ongoing program at WIYN targets these rare objects, which are most often discovered by survey telescopes, to provide clues on the mass-loss mechanism. 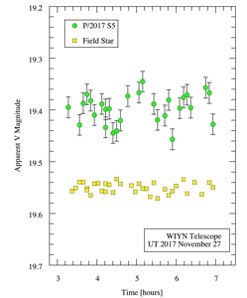 P/2017 S5 was observed at WIYN in November 2017, using the One Degree Imager (ODI). The sharp, wide field images were used to characterize the nucleus and activity of S5. 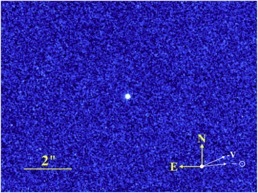 An archival image from the DECam survey (from the Blanco telescope at CTIO, Chile) from October fortuitously captured the target about a month before the WIYN observations. High resolution observations from the Hubble Space Telescope (HST) about a year later (September 2018) completed the data set used to answer the central question "what drives the mass loss?" The resulting paper, Jewitt et al, 2019, AJ 157, finds that the protracted nature of the mass loss is compatible with sublimation being the answer, meaning that this object is likely an ice-bearing main belt comet. This adds to the small but significant number (about half of the known population) of active asteroids that are now thought to contain water and is another step towards understanding the origins of water on our own planet. LEFT: CTIO 4m image taken on UT 2017 October 25 CENTER: WIYN 3.5 m image taken on UT 2017 November 27. The cardinal directions, the position angles of the antisolar vector and the negative projected heliocentric velocity vector (-V), and scale bar are shown for each image. From Jewitt et al., 2019. RIGHT: Composite HST image from UT 2018 September 07. From Jewitt et al., 2019. Photometry of S5 from WIYN (3” radius aperture) compared with a field star of matching brightness. WIYN photometry shows that S5 does vary by an amount larger than the field stars. The best-fit period is about 1.4 hours. This is tentative evidence for rapid rotation, which if real, may play a role in the mass-loss and could be a consequence of spin-up by sublimation torques. For more details please see Jewitt, D., Kim, Y., Rajagopal, J. et al., 2019, AJ, 157. WIYN scientists Jayadev Rajagopal, Susan Ridgway and Wilson Liu are co-authors, and so is Ralph Kotulla from our partner institution, the University of Wisconsin, Madison. The program is led by Dave Jewitt at UCLA. NASA has selected a Pennsylvania State University research group led by Dr. Suvrath Mahadevan to build a new, cutting-edge instrument for the 3.5-m WIYN telescope at KPNO. By measuring the subtle back-and-forth motion of stars that is induced by their orbiting companions, the new instrument, an extreme precision radial velocity spectrometer, will detect and characterize worlds beyond our solar system. Further information can be found in the NOAO Press Release. See also the NASA Press Release and the Pennsylvania State University Press Release. 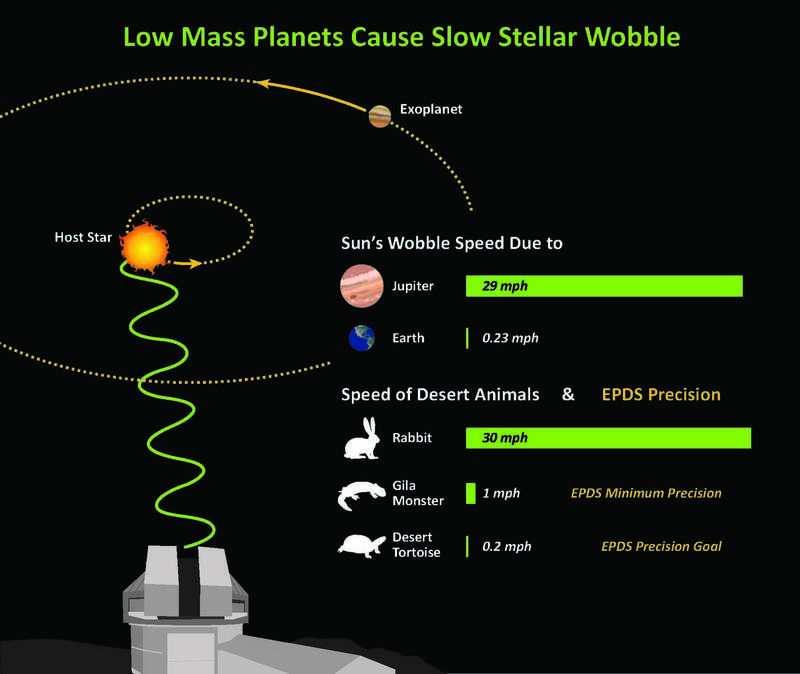 Figure 1: Very high velocity precision is needed to measure the mass of low mass planets through the subtle motion, the “wobble”, that a planet induces in its host star. The extreme precision radial velocity spectrometer (EPDS) destined for Kitt Peak will measure stellar motions with a precision of 0.1 - 0.5 m/s (or 0.2 - 1 mph), velocities comparable to the running speed of a desert tortoise or gila monster. With such high precision, the spectrometer will be able to detect and characterize Jupiter- and Neptune-sized gas giant planets as well as super-Earth and Earth-sized rocky planets. Two federal agencies, NASA and NSF, have joined together to continue community access to WIYN through a program of research related to exoplanets known as NN-EXPLORE. NN-EXPLORE will be managed on behalf of the federal agencies by NOAO, which will remain a WIYN partner. Phase 1 of this program (launched in 2015) offers access to WIYN's existing suite of instruments for exoplanet related research. Phase 2 entails the design, construction, and deployment on WIYN of a NASA-funded Extreme Precision Doppler Spectrometer (EPDS), as detailed in the announcement of opportunity. NASA's goal is to have the instrument operational on WIYN data begin flowing from the Transiting Exoplanet Survey Satellite (TESS) mission. This program is described in a recent NOAO press release. NASA selected the instrument concept proposed by a team from Pennsylvania State University. The NEID instrument (NN-EXPLORE Exoplanet Investigations with Doppler Spectroscopy) is expected to be installed at the WIYN 3.5m in early 2019. For more information please see the official announcement.